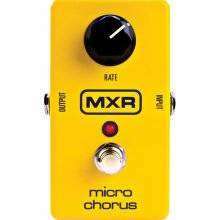 With its simple operation and stellar analog tonethe MXR Micro Chorus joins the ranks of MXR Classics such as the Phase 90, Dyna Comp and Micro Amp. This 80s reissue delivers a stunning range of rich chorus textures, from sparkly watery shimmers to intense rotating speaker simulation with a twist of the Rate control. The Micro Chorus is designed with old-school bucket brigade technology for warm analog tone and features true bypass for pure guitar tone when the pedal is off. Its road-worthy hardware and components are housed in a space saving Phase 90 sized box. I really like the sound of analog stomp boxes and MXR makes some of my favourite pedals. Before I bought it, I A/B'd it against a few other chorus pedals and liked it the best. This is an easy-to-use warm sounding pedal. It's well made (what do you expect from MXR) and doesn't take up much real-estate. I definitely recommend it! great pedal for my Strat,small, not complicated for sure,tough and handy! I used to play through a Line 6 POD but got tired of twisting dials and flipping through menus to find and change sounds. I've since gone back to using stomp boxes and a couple of amps. Too many options is like kryptonite for a guy like me so this pedal is perfect as I can dial in 3 or 4 very distinct and usable chorus sounds with the twist of one knob. It takes up very little space on my pedal board and is built like a tank. Excellent and reasonably priced option for people like me who would rather play guitar than fiddle with their gear for hours. One dial. Doesn't get any easier. Sounds great without breaking the bank. It's a chorus; you don't need all kinds of dials.